We’ve all had that tragic experience of going to a hair stylist armed with a handful of magazine pictures and a heart full of expectations only to look in the mirror afterwards and be horrified at the image gazing back at us. It can take months if not years for our hair to grow back and just as long (if not longer) for our trust in anyone holding shears to be earned back. 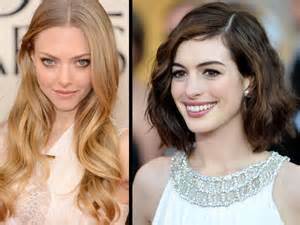 DO look for styles that elongate your face with a side part and long layers. Emma Stone’s flattering bangs and textured hair style compliments her round face perfectly. DON’T go for a style that is full on the sides or ends near your chin. This will just make your face look rounder. DO think about your hair texture when considering a style. Fortunately with this face shape almost any style could work, but you’ll also need to consider whether your hair is thin, curly, etc. as another determining factor. Oval face shapes can get away with just about any hairdo. DON’T clip out any picture from a magazine and think it will work for you. Other than hair type, you should also consider humidity and how much time you want to spend fixing your hair in the morning. DO consider side swept bangs. Think of the actress Reese Witherspoon. She’s had a variety of haircuts with varied lengths, but her bangs usually stay side swept because they draw the eye down and minimize a broader forehead. Heart shaped faces look best with side swept bangs. forehead appear wider. Consider having them side swept as mentioned or shorter in the middle (starting at the top part of the bridge of your nose) and angling down to the top part of your cheekbones. 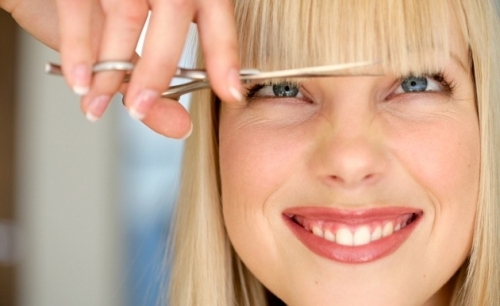 Also, many stylists like to cut bangs when they are dry since hair tends to shrink a bit. Too short bangs are a definite no-no. DO look into softer haircuts with wispy layers or beachy waves. Hair with lots of texture softens the angles of a square face. DON’T get a blunt cut that accentuates the angles of your face. These tend to be too masculine. DO try styles that de-emphasize the jaw line such as angled bobs or lobs that hit below the chin. DON’T get a bob that doesn’t have bangs and ends at the chin or shorter. This will just make your face appear more angular and will appear unflattering. Lobs and long hair look great on triangle faces. 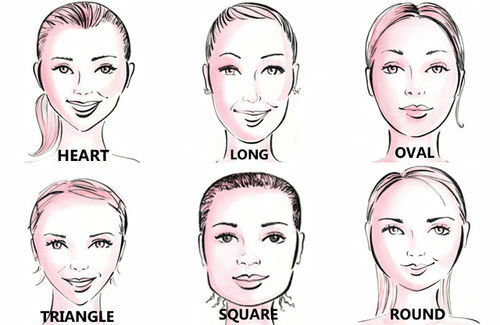 Still unsure of what type of face shape you have or what style will look best on you? Wig Works and Extensions for Hair is one of the premier salons in the San Francisco Bay Area and our experts can help you find the right style for you. Whether you are looking for a wig or hair extensions or just a new hairdo for your natural hair, we can find the style and cut that will make you feel fabulous. Clip On/In Hair – This type of hair extension has pressure sensitive clips that attach to your real hair. You can apply them within minutes to get fuller and/or longer hair or to add highlights. One great benefit is that they are also less damaging than semi permanent extensions since they don’t use glue or cause breakage to your natural hair. Ponytails – Sometimes a girl just needs to put her hair back on a hot day, but while shoulder length hair may look great down, it can look a little wimpy in a ponytail. Also, if you have thin hair your ponytail may look stringy or sparse. Ponytail hairpieces are a great option and can either clip on or tie on to your existing hair. Bangs – I’m not sure what comes in and out of style more often: high waisted pants or bangs. Fortunately with bang hair pieces, you can just clip them in to instantly change your look without the excruciatingly long period of growing them back out if you change your mind. Monomiracle Wire Extensions – This type of extension has the hair attached to a thin wire that sits on the crown of your head and your natural hair is adjusted over it to hold it in place. It seamlessly blends into your hair to create length and volume. 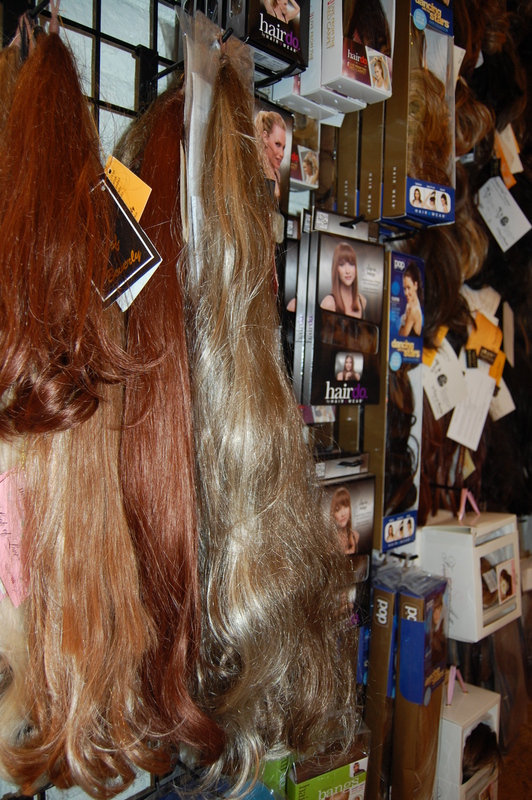 Wig Works keeps a variety of temporary extensions in stock. At Wig Works and Extensions for Hair, we have thousands of temporary hair extensions and hair pieces in stock so you can find the one that looks best with your hair style. With our seasoned experts and onsite salon, we can show you how to attach and care for your hair piece and we can also trim it for a natural look. Whether you want to look your best for a big event or just want to take your everyday style to the next level, we have a variety of options that will work for you. I love the Internet for many reasons: I can look up anything I need to know, it’s a great way to stay in touch with special people that I’ve met throughout my life, and I can shop around to find exactly what I want. However, those reasons also have big downsides: you could be reading information that is made up (or get completely paranoid over minor medical conditions), social media allows some unpleasant acquaintances to “friend” you and comment on every single item you post and shopping on the Internet can be quite misleading. What you see isn’t always what you get. – A picture may be worth a thousand words, but nothing speaks louder than when you can actually touch and see in person what a wig is truly like. It’s easy for online retailers to access photos from reputable wig makers and post them on their websites. However, when customers receive their orders, it doesn’t look or feel like what was promised. The value of a professional’s expertise. 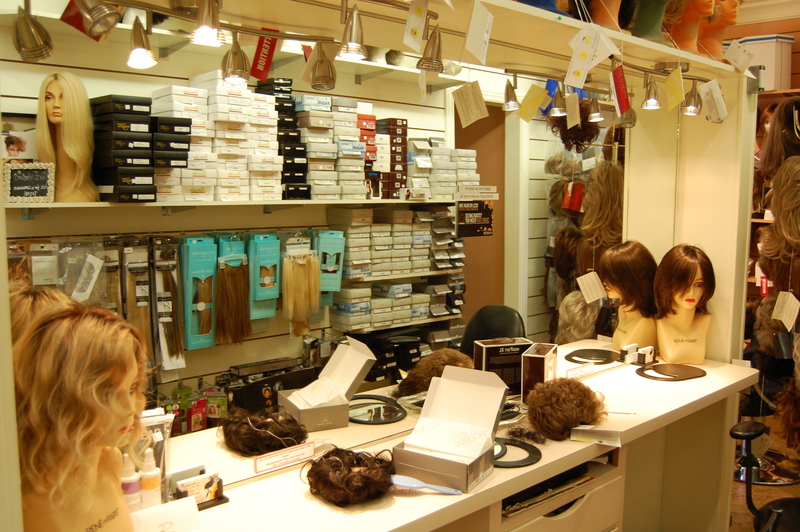 – Buying a wig can be a complicated process. Should you buy a human hair wig or synthetic? What type of wig cap is most comfortable for you? What type of wig best fits your lifestyle? How should you care for your wig? What style and color is most suited to your facial features? What if you want to change your style in the future? Look for a professional wig shop in your area to ensure that all of these important questions are answered before you make your purchase. You’ll need to try it on. – Like most people, I love the convenience of shopping at home via the Internet. However, there are a few things that I absolutely will not buy online because I’ve spent too much money on return shipping. Shoes, pants, and undergarments need to be tried on because their styles and size measurements vary too much between manufacturers (or even when brands update their products). I absolutely need to try these items on to ensure a great fit. The same is certainly true for wigs. You may love a chestnut brown bob, but there are so many factors that make each wig unique that trying it on is the only way of knowing that the fit, texture and color are right for you. How Do I Choose the Right Hair Stylist? Posted on July 24, 2015	by Janelle P.
Finding the right hair stylist is one of the hardest things in the world for many reasons. 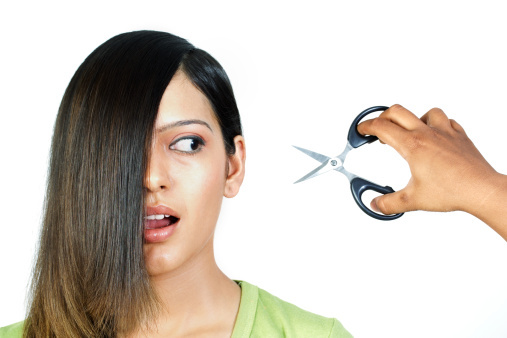 After all, the choices can be overwhelming (there are over 86,000 salons and barber shops in the U.S. alone!). Secondly, this stranger has the ability to make or break your look with just a few snips of their shears; the only way to know if you’ve found the right one is to actually sit in their chair and let them style away. So where do you even begin to find your hair’s soul mate? One of the first things I do before I eat at a new restaurant is to check out a customer review site and this certainly works for salons, too. I love Yelp! because I can research just about any local business to see if it’s worth my time and money. All you need to do is go to the website, type in “salon” and your city, and a list will pop up with reviews, price points, contact information and a map. You can also sort by best reviews, most reviews or closest to you so that you can narrow down your options. Secondly, you should assess any special needs you may have to see if a stylist in your area has the skills to address your hair issues (like if you have curly, thinning or damaged hair). Take note of your friends who may have similar hair struggles and ask about their stylist. You might consider calling the top three salons that you found on a review website and ask if any of their staff has experience in treating your hair problems. Next, make an appointment for a consultation. During your visit, look around to see if the salon is clean and sanitary. Are clean combs brought out or is there hair all over the floor? Check out the waiting area. Have the clients been sitting there awhile? In addition, does it fit your budget? What types of products are they using? What does the price include (dry cut or cut and style)? Finally, if you do decide to try out a new hairstylist, consider the following: is she rushed or does she focus on you to get the job done right? Does she listen to your requests and give you the style you described? Was she able to skillfully address your special needs and did she give you practical advice for maintaining your look? It’s hard to find a stylist that is the full package. When you think about seeing this person every three months, the financial investment that a good hairstyle requires, and the time and misery that can come from a potentially bad haircut, it’s certainly worth the effort and research to find the right salon and stylist. Finally, the greatest stylist in the world can’t give you more hair like Extensions for Hair Salon can! 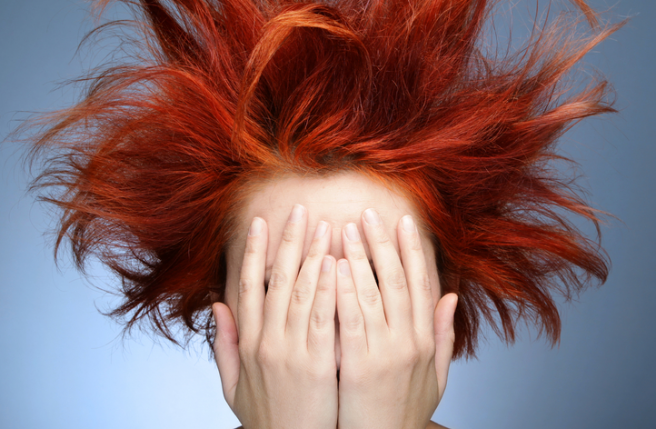 Have you walked down the hair care aisle of a grocery store or a big box store lately? It can be overwhelming! There are rows and rows of brightly colored packaging each boasting how it can protect hair color, preserve spring-like curls, prevent split ends, or add 50% more radiance. 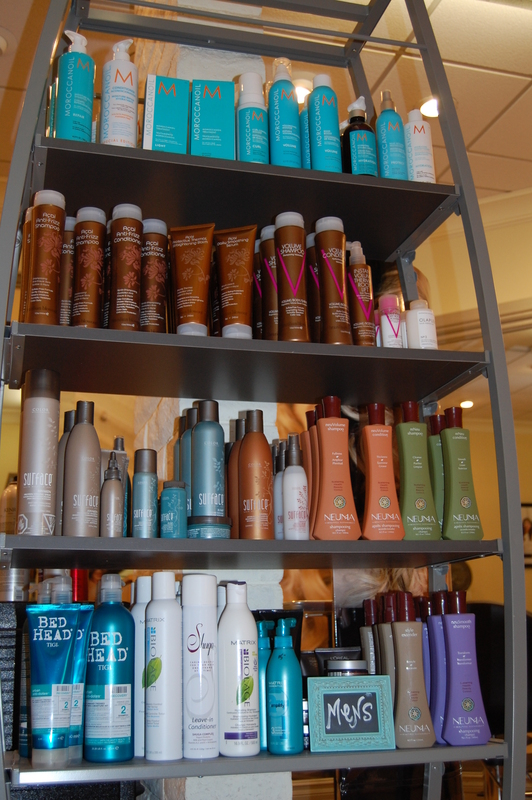 The options get even more complex when you walk into a beauty supply store or salon. The prices are higher and so are the promised results. Furthermore, if you have a wig which products are right for your expensive hair piece and what additional products are available to keep it in place and looking great? Hopefully this list will help! Combs and Brushes– Use only wide tooth combs and wig brushes designed with unique bristles that are designed for wig care. Regular combs and brushes will damage your wig since they tend to tug and loosen the strands. Shampoos and Conditioners – For human hair wigs, any salon quality product will work beautifully with your wig since it is made for human hair. For synthetic hair, use a shampoo and conditioner that is specifically made to cleanse these fibers. 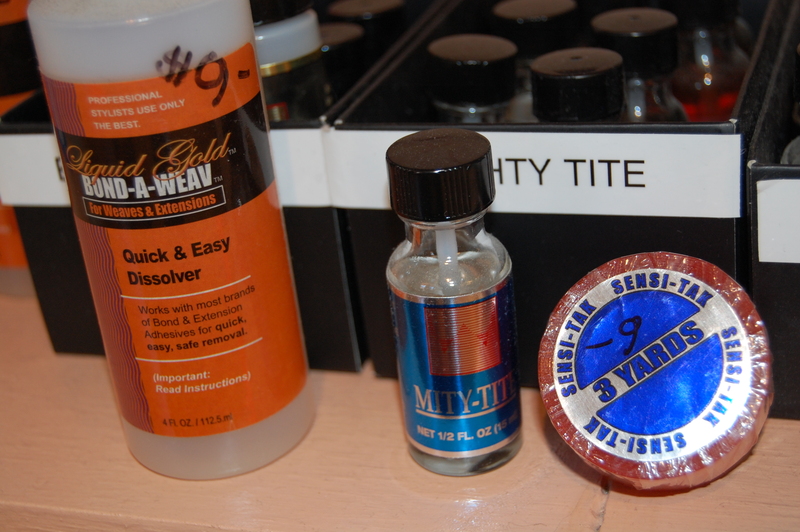 Tapes and Liquid Adhesives – There are two types of wig adhesives: adhesive strips and liquid/semi-liquid adhesives. Different adhesives are used depending on your needs. For instance, daily glues can hold your lace wig in place until you decide to remove it at night and tends to be extremely secure and comfortable. It also dries clear for a natural hairline and you can sleep in it if needed. However, it will lose its effectiveness by the following day and must be reapplied. Scalp Protectors – This is used to help adhesives work better, especially for those who have oily skin or need better adhesion during swimming or sports activities. Adhesive Remover – Adhesives are obviously strong and you will need a solvent to help dissolve any residue from your scalp and to prevent damage from pulling on the wig (or hair loss if the adhesive is embedded in your natural hair). Wig Caps – If you want to cover your natural hair with a wig, a wig cap covers your hair and prevents slippage. 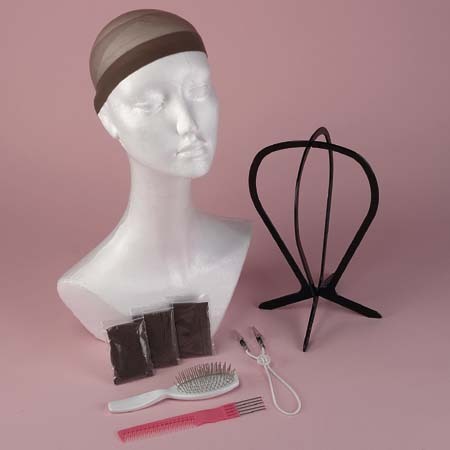 Wig Stand – The best way to store or dry your wig is on a wig stand. 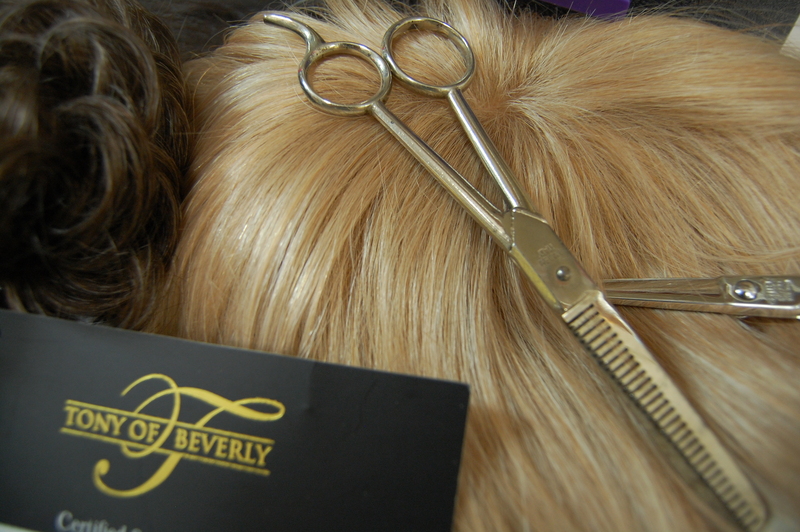 There are many types available that help to ensure that your wig maintains its style and shape. 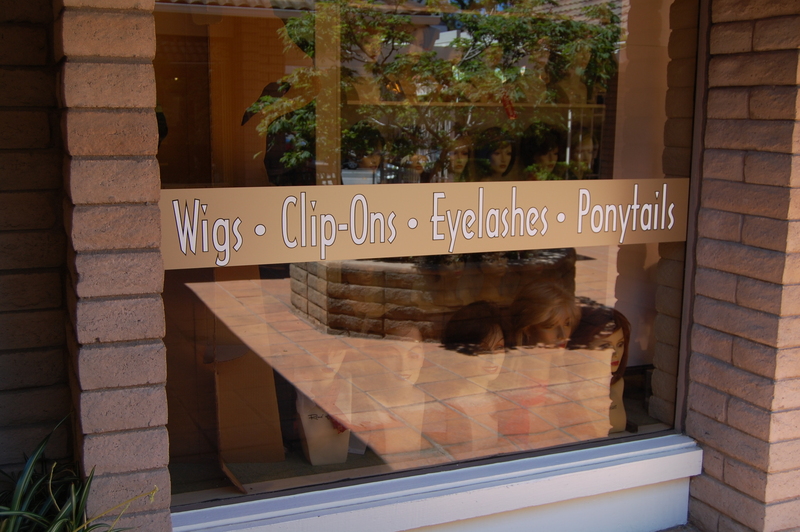 Wig Clips – Sew in clips have mini-combs attached for women who wish to clip in their lace front wig, frontals or wefts. You can clip your wig to your natural hair for a secure fit. 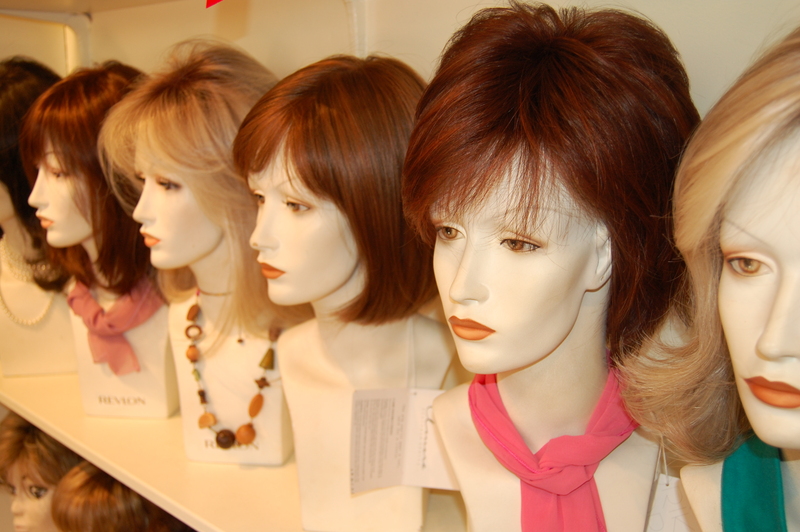 Finding the right products for the care and wear of your wig can seem intimidating. That is why at Wig Works and Extensions for Hair Salon, we have a friendly, knowledgeable staff that is excited to help you with all of your hair care needs. Come in today and we can help you to pick out the items that are just right for you!